The banking sector routinely manages massive amounts of data, ranging from financial transactions to customer, operational and regulatory data. All this data means big challenges - but also big opportunities - for the industry. 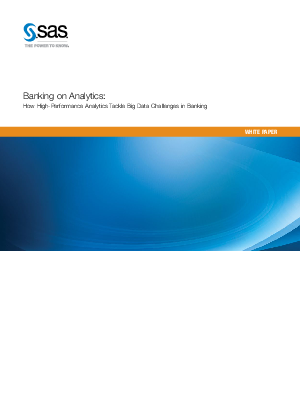 Using high-performance analytics, banks can turn their big data into pertinent new business insights that guide faster, better decisions. As a result, banks can successfully manage risk, retain profitable customers, improve operational efficiency and differentiate themselves in the marketplace for competitive advantage.